June Cashmere collects its premium cashmere knitting yarn from small family farms in the mountain communities of Kyrgyzstan, then processes the fleece at artisan mills in Great Britain where our fiber is expertly spun. The final stop at the Saco River Dyehouse in Maine creates the rich colors of June Cashmere DK. This yarn takes a truly unique trip around the world to obtain its unique warmth, beauty, and luxurious feel. June Cashmere's 100% cashmere yarns are collected directly from Kyrgyz shepherds living on small family farms along the ancient Silk Road amidst the soaring mountains of Central Asia. June is the Kyrgyz word for animal fiber, which is a centuries old vital resource and essential element of their nomadic lifestyle. From felted woolen rugs, to the clothes on their backs, june has made itself an indelible part of Kyrgyz culture. Additionally, the uniquely warm properties of the cashmere from their goats allow them to sustain cold and long winters in the vast mountains in Kyrgyzstan. 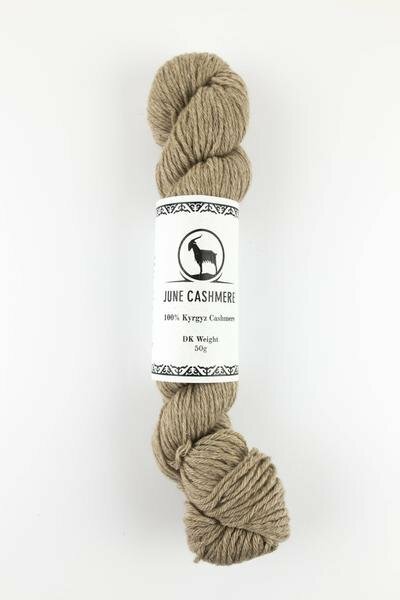 The origins of June Cashmere started with the seed vision of J.C Christensen and his family, owners of Morning Star Fiber, which is located in Andrews, North Carolina. They opened their mill in 2005 and soon after in 2007 had the opportunity to meet a group of Kyrgyz artisans who were traveling in the US. Through this encounter they became aware of the need for revitalization in the Kyrgyz fiber industry. Shortly thereafter JC connected with Sy Belohlavek from Columbus, Ohio, who had worked in Kyrgyzstan previously. Sy was very drawn towards helping bring the idea to fruition and ultimately moved with his wife and two small children (they now have five) to Kyrgyzstan in late 2010 to begin working towards actualizing the vision.